Can my leggy Desert Rose, about 4 years old, be trimmed? And, if so, how? It blooms well but there are few leaves on the branches which make for a "thin" and sparse look. Trim back tall, overly vigorous shoots, cutting these long stems back to or just below the height of lower stems, making clean cuts just above a leaf node or junction with another stem. You can prune a desert rose year-round, though pruning the plant in late fall may promote a flush of new growth that is especially susceptible to cold weather damage. Blooming occurs on new growth, so timing pruning well before flowering encourages more branching and, as a result, more blooms to develop. 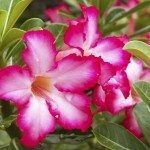 Prune back any crossing or damaged branches and otherwise shape the desert rose as desired.